Really handy for when you can't quite make the bottle spout fit right when filling rear diffs or gearboxes etc. 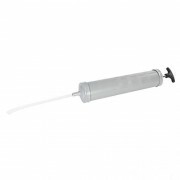 Also great for removing fluids if you can't get the diff drain plug out or if you've overfilled. 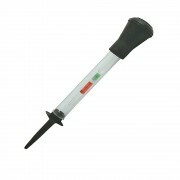 Has a 500ml capacity and works like a large syringe. Plun.. SO simple but just brilliant. 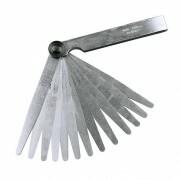 Bevelled and hatched scale edge tapers around the circumference to suit the gap you want to measure/adjust. 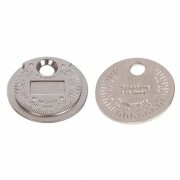 Don't phaff around with feeler gauges, make this your new key fob! Metric 0.5 - 2.55mm Imperial 0.02 - 0.1". Solid alloy steel. .. 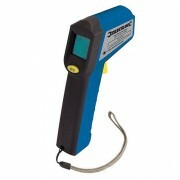 Paint thickness gauges have several benefits but the professional ones are very expensive. 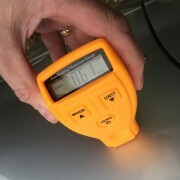 This little bit of electronics is accurate enough to be a good guide, yet cost effective enough for the man in the street or small business to own. 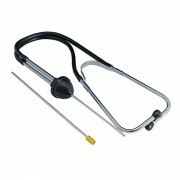 Three key uses are: 1) Measuring thickness to highlight.. 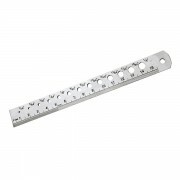 Useful 6" long stainless steel rule for measuring, marking and cutting but with the added feature of apertures to help you identify what Imperial size hole you are dealing with and/or for picking the nearest metric bit you have. (Also good for telling what the size of your drill bit is for thos..